Hope Whispers: When Life gives you Lemons. Make Lemon bars! When Life gives you Lemons. Make Lemon bars! Over the holidays I was pet sitting for a neighbor. Just about every Christmas for the last few years I have had extra pets in my house but this time, I just had to take a short walk across the street. It worked out perfectly. When they got back I confessed to snagging a lemon from her tree. I knew she wouldn't mind. Later, they brought me over 2 shopping bags full of lemons. And these aren't your average size lemons. They are Texas lemons. Twice the size of the ones I get at the store! 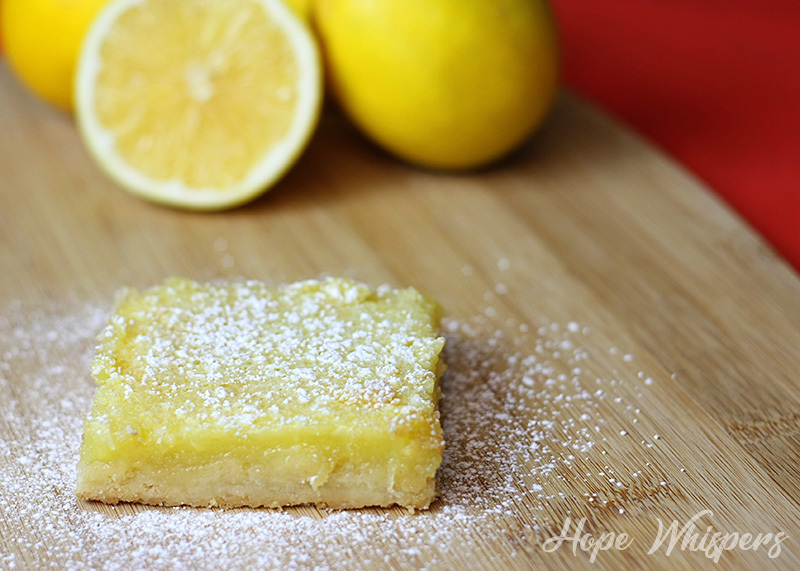 So as a thank you for the lemons, I made her a batch of lemon bars! I don't know where this recipe came from because it was typed out with a bunch of other recipes my dad passed along over the years. But its one of my favorites. They hold together so well and are sweet but tart. And apparently irresistible. I walked away for a minute and there was magically a bite missing from my bar. But who ever stole a bit was sure to shake more powered sugar over it in hopes that I wouldn't notice. Sigh. In a large bowl, mix the 2 cups of flour with the powdered sugar and cut in the butter with a pastry blender to crumb size. Grease a 9x13 pan and pat the crust down evenly. In a medium bowl, whisk eggs, sugar, 3T of flour, lemon juice and salt till smooth. Take the crust out of the oven and pour the lemon mixture over it. Serve dusted with more powdered sugar. I froze half of them. I sliced and halved them and laid them out of a piece of parchment on a cookie rack in the freezer for a few hours. Then I shook them loose and packed them up in bags. I throw them in water or tea. Adds a little flavor and keeps you cold drinks cold. Plus cool down my tea with out watering it down! Lemon Pepper Turkey brought smiles to the table last week. We love this dish. Its easy, inexpensive and delicious. 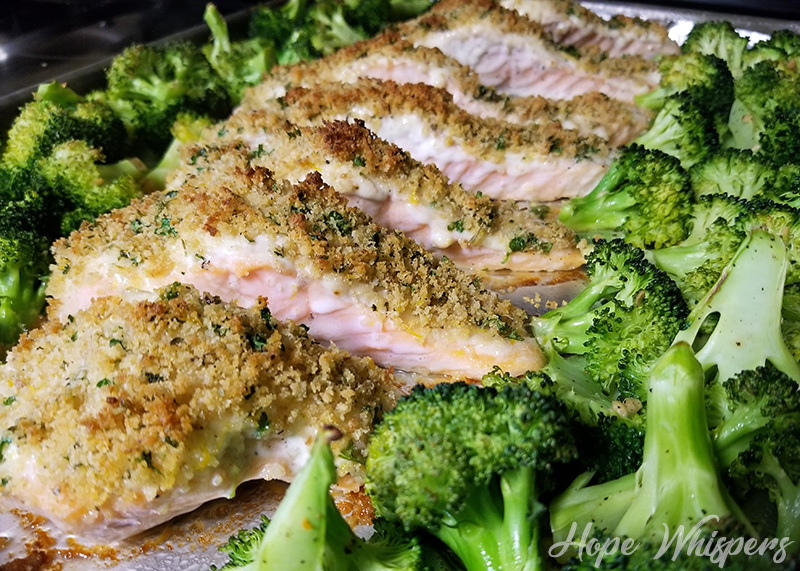 This Salmon Recipe was a big hit too. It was even better with lemon juice squeezed over the top of it. I have also made a few batches of homemade lemonade. And I still have lemons left. 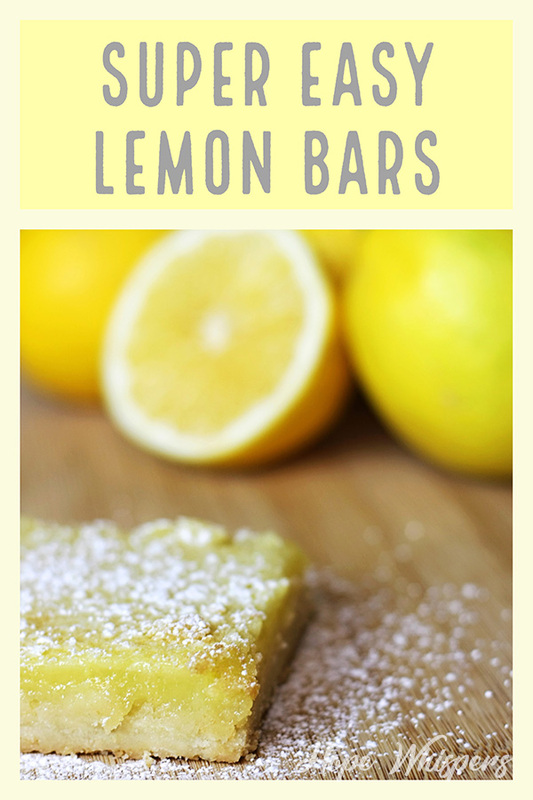 I have no idea what I am going to do with them yet but I have created a Board on Pinterest just for all things Lemon. I think maybe I will try the Homemade Garbage Disposal Lemon Bombs I pinned. And maybe the lemon crumb muffins! YES! What I really need is my own lemon tree. I guess I will have to work on that once spring comes around. Which is welcome to come any day now. I think I am officially over the cold.